Oho, thought I, I'll box clever. Instead of wearing my waterproof boots (but if the water is more than ankle deep, it fills my boots) I'll wear wellies. My wellies are almost knee high, so I was sure to stay dry today! 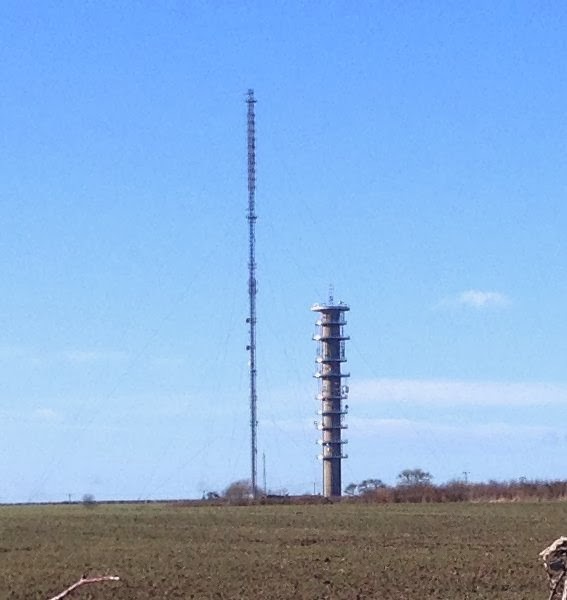 Soon I was enjoying great views of the Morborne transmitter. So first I did "Haddon and back", which turned out to be 26 caches. 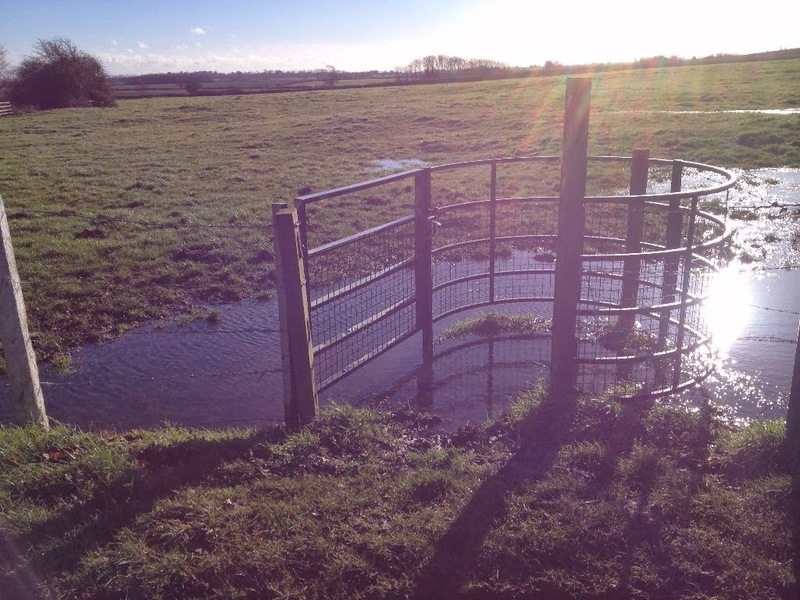 A lot of the ground was very soggy, which made cycling difficult. I got back to the car dry-foot at about 2pm, and had lunch while I warmed up a bit. Then I swapped the two used bike batteries for two fresh ones, and set off on the "Chesterton and back" circuit. More soggy bridleway, much effort required, but the batteries were doing a good share of the work. 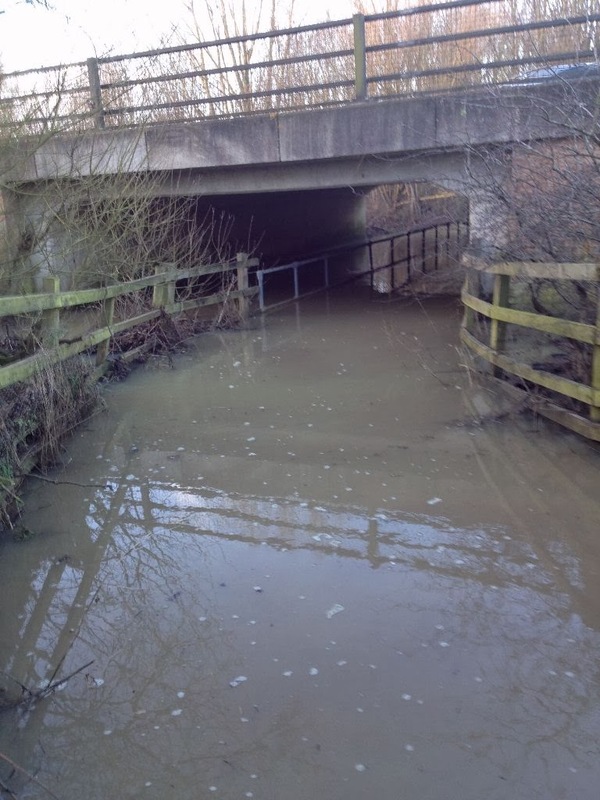 Then I reached the A605 underpass, and this is what I saw. Of course, you can't tell from that how deep it's going to be, maybe it's an inch or so? Maybe. Maybe not. No. It got deeper and deeper. 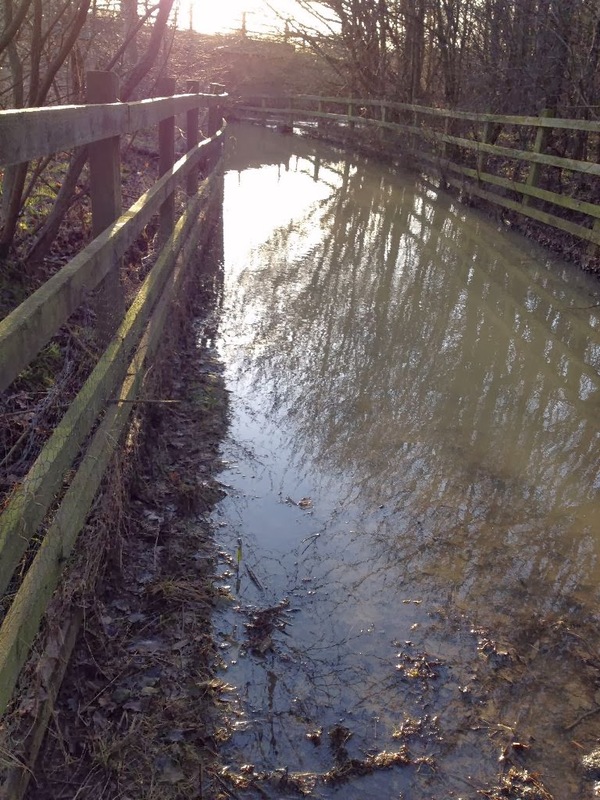 Deeper than my wellies, at which point I got two bootfuls of water. And I had to lift up the front wheel of the bike, because I didn't want to get water in the electric motor. But the back end had to take its chance, I can't schlep 52 pounds of bike plus 12 pounds of battery, and so my panniers got really wet, which means that the batteries got wet. But I wasn't too bothered, they're waterproof. I hope. The picture above was taken after I'd gone through. As you can see, the water came about a yard up my legs. And here's a shot taken after I got through. You can see where the steel railings are a couple of feet under water. Fortunately, I'd planned this so that by now, I was near the end ouf the circuit, so I just had to squelch back to the car. The bike still worked, I'm glad to say. I finished with "Yaxley Yabadabadoo" number one, a cache that I've failed on twice before now. This time, I found it immediately! A great (although wet) day out, 61 cacnes found, no DNFs.